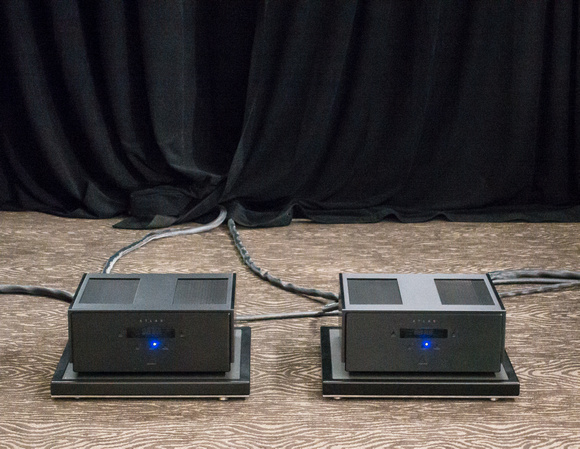 Musical Surroundings debuted its 300-watt Aesthetix Atlas Mono Eclipse amplifiers ($25k/pr.). 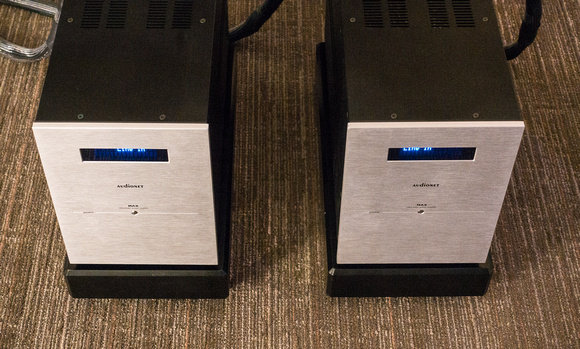 After being teased by their appearances in static displays—at this year’s CES, for one—it was nice to hear these amps actually performing at last. The Mono Eclipse features super-matched solid-state output devices, distributed-node film capacitors for increased power and improved transient response, and ultra-high-quality StealthCaps tailored especially for the Aesthetix Eclipse Series. 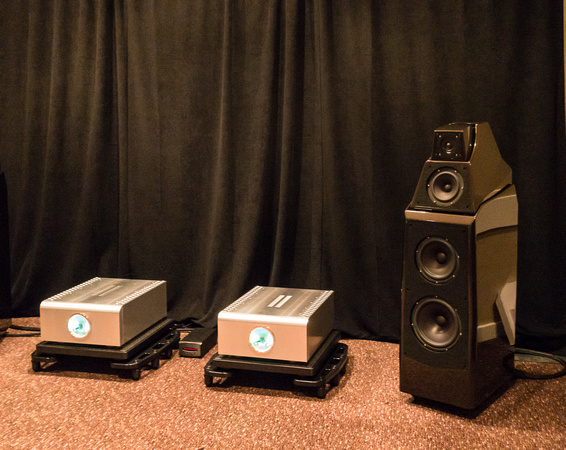 In Chicago, the Mono Eclipses were driving Sonus faber Lilium loudspeakers, which incidentally sounded better than I’d ever heard them sound before. Could it have been the electronics? Gone was much of the darker, less natural timbre and poor instrumental separation of the past; on hand were greater cohesion, energy, and musicality. And the sound only got better with time, as I discovered when I returned Sunday afternoon for my last stop of the show. Through the Aesthetix/Sonus system the raw emotional power and slam of a promo 12-inch single of Patti Smith’s “Gloria” made for a rocking AXPONA finale. At an even loftier price than the Aesthetix Atlas/Sonus Lilium system, the sleek, elegant German-made electronics and loudspeakers of Tidal made for a beautiful-sounding demo in The Voice That Is room. The Tidal Presencio preamplifier ($77,990 with phonostage) and Impulse Monobloc amplifiers ($64,990)—both North American debuts—were driving Tidal’s one-step-below-flagship Agoria loudspeakers ($109,900), which boasted pure-diamond tweeters and black ceramic drivers. Surprisingly, sources were only digital: an Aurender W20 Reference music server and a Bricasti Design M1 SP DAC. The 390-watt Impulse Monobloc power amps featured speaker-controlled sound adjustments (such as damping), and provided power with ease and finesse. Although the electronics’ marketing materials spoke of a lack of sonic signature or coloration, the highly resolved presentation overflowed with inviting richness—warm as silk and smooth as honey. In a word, gorgeous! And yes, for this kind of coin, the sound ought to have been knockout, and it was—even if not the most true-to-life. The powerful vocal harmonies on “These Bones” from The Fairfield Four were filled with expression, body, and vitality. Like the Aesthetix Atlas Mono Eclipse monoblocks, the D’Agostino Progression monoblock amplifiers ($39k/pr.) made their debut at AXPONA after being on static display at CES. 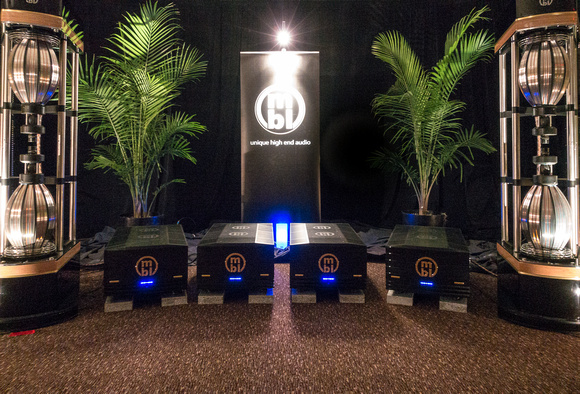 These 800-watt heavyweights are key components in Dan D’Agostino Master Audio Systems’ new Progression Series, which is designed to deliver the designer’s high-quality sound at (relatively) more affordable prices. One cost-saving factor is the use of aluminum instead of copper for the venturi heatsinks—a second row of which has been added in this design. As with all D’Agostino electronics, the new series features hand-built, through-hole construction and displays the maker’s stunning industrial design aesthetic, complete with his iconic (and vaguely Steampunk-looking) power meters, here with a 270-degree-swing needle that covers the amp’s entire power-output range. 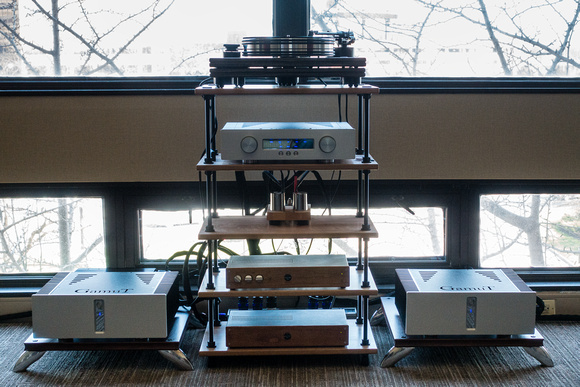 At AXPONA, the monoblocks—along with a D’Agostino Momentum preamplifier ($35k) and phonostage ($28k)—were driving Wilson Audio Alexia loudspeakers, playing back tunes from a variety of analog and digital sources in rotation, including a Brinkmann Audio Spyder turntable ($17,535) with Brinkmann PI cartridge ($2490). The imposing Stromtank S5000 battery power source was also in the system, taking all the electronics off the grid. Cabling and interconnects were from Transparent, and the amp isolation base and other stands were from HRS. Maybe it was in part the room, but I really wished I could have heard these powerhouse amps paired with different speakers, especially as this was their first time out. (Based on some of the comments I overheard, I wasn’t alone in this sentiment.) The Progression monoblocks are available in a silver or black finish and are slated to ship in Q2 of this year. The new Progression Series will continue with forthcoming launches of a stereo amp, a stereo preamp, and a lifestyle integrated amp/DAC/streamer. Last but not least in the lineup of high-end electronics debuts comes a manufacturer of strikingly handsome tube gear, Raven Audio, which introduced a handful of new products—some in my price category. Sourced by Metronome Technologie digital, the Raven electronics drove an assortment of Legacy Audio loudspeakers in a multi-system demo. One system featured the debut of the flagship Raven Shaman MK2 monoblocks ($49,995) driving Legacy Aeris loudspeakers. With an output of 350–390Wpc and a chassis milled from solid ¾-inch-thick billet aluminum, these big guns had presence, power, and style to spare. The MK2 version is said to improve on the original in that it’s a bit lighter in weight and has new power supplies that control voltages to within 1%. Also, the MK2 model manages to get more clean power from 8 output tubes than the prior version did from 12. Another brand-new introduction was the Silhouette MK2 ($29,995), shown on static display, which has a new power supply and an updated VU meter (as does the Shaman) that lights up orange to match the warm glow of the tubes. 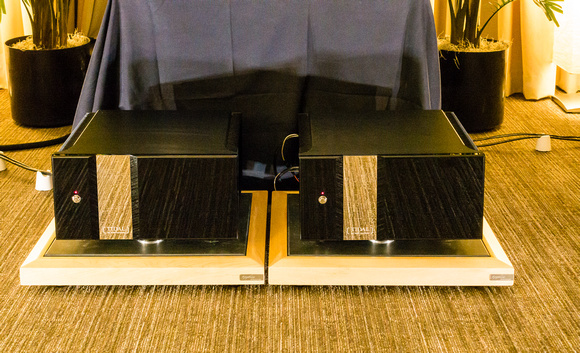 Also in my category (but not debuts) were the four Raven Spirit 300B MK2 monoblocks ($25k/pr.) that powered the Legacy V speaker ($51,500). Another debut worth a mention (though not in my bailiwick) was the Raven Reflection MK2 ($13,995) that features all-new topography. Released in December 2015, the limited-edition Devialet Copper Dual Mono D900 monoblocks ($36,900/pr. ), a.k.a. Devialet Original and a close relative of the D800, definitely made a showy statement in a shiny gold-and-champagne copper chassis. Bien sûr, there’s a square-shaped remote control to match. As of the time of this writing, only one unit of the 100 made is still available in the U.S. for purchase, making this amp a, uh, rather limited edition. The D900’s form-factor is extremely slim and streamlined, especially given its 900 watts of Class A/D power. The D900 is an upgrade to the 800-watt D800; both feature the company’s proprietary ADH (Analogue Digital Hybrid) technology. “It’s a little bit like power steering in a car,” said Devialet’s Manuel de la Fuente. “You have a very linear Class A amplifier that sets the output foundation, and it’s directly connected in parallel to the loudspeaker output. We provide current voltage via Class D, so we relieve the Class A amp at any moment of the burden of delivering most of the current to the load that it’s seeing.” The D900 is a closed-box design with no cooling system, so the chassis does double-duty as a heatsink to dissipate and transfer the heat from the electronics to the chassis. To facilitate this, the D900 employs a special thermal material used in aerospace applications that has extremely good heat-transfer capabilities (and also helps minimize vibration), but the D900 still generates plenty of Class A heat. Hanson Audio’s Andres Sauceda joked that you could almost fry an egg on top. The D900 pair powered Magico S3 loudspeakers sourced by a Clearaudio Innovation Wood turntable ($15k) and an Aurender N10 ($8k) as sources. 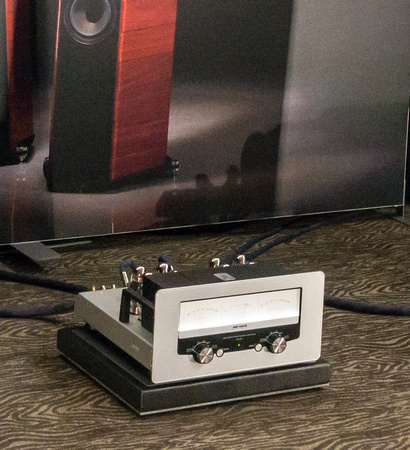 Another AXPONA debut was the 250-watt Thrax Teres hybrid mono power amp ($28.9k/pr.). Introduced in a static display at the 2015 RMAF, the Teres is a transformer-coupled tube/FET hybrid with single-ended tube input stage. It features JFET/MOSFET cascade output modules and a sleek, solid chassis “built like a tank,” according to its marketing materials. 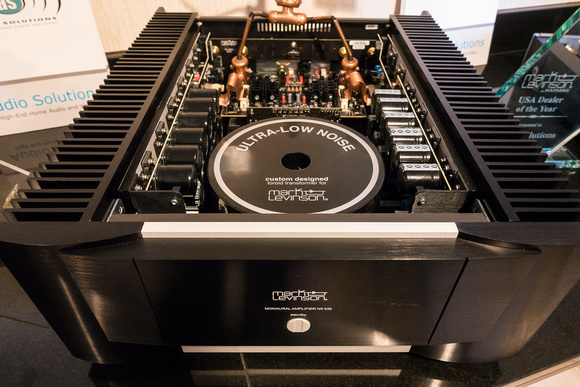 At the time of AXPONA, the 400-watt Mark Levinson No. 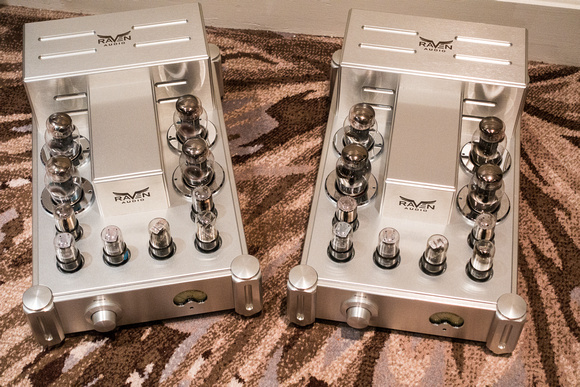 536 monoblock amplifier ($15k each, $30k/pr.) had been in market for about three months. It’s a 100-pound, high-current Class AB amp (Class A up to 5 watts) that pumps out 800W into 4 ohms and 400W into 8 ohms. Its direct-coupled design features a fully discrete, differential signal path from input to output, and a custom-designed, low-noise 1800VA toroidal transformer. A pair effortlessly drove the humongous JBL Project Everest DD67000 horn/cone hybrid loudspeakers, through which JV and I enjoyed some Buena Vista Social Club tracks that were reproduced with lively energy and gusto, particularly on brass and vocals. I can’t resist sharing some comments on a few other great-sounding rooms—especially those with electronics in my assigned price category. Sonus faber Il Cremonese loudspeakers, which hadn’t thrilled me on other occasions, really pleased my ears more than they ever had before. Here driven by ARC Reference Phono 3 ($14k), Reference 6 linestage ($14k), GS150 stereo amplifier ($20k) sourced by an AMG Giro 9 turntable, the Sonus Il Cremonese balanced warm, rich timbre with exceptional transient speed and noteworthy bloom and air. Cables were Kubala-Sosna Emotion, and equipment racks were top-notch Critical Mass Maxxum stands. Another of the systems I most enjoyed—also see Best of Show below—was the pairing of the YG Acoustics Hailey 1.2 loudspeakers ($42.8k) and solid-state electronics from Audionet of Germany—the PRE G2 preamp ($23,350), MAX mono amps ($30.5k/pr. ), and PAM G2 phonostage ($10.1k). We stuck to the room’s analog source, a Kronos Pro ’table with Black Beauty ’arm, and the superb Air Tight Opus 1 cartridge. I must also give a shout-out to Alon Wolf’s impressive all-analog (tape deck and turntable!) setup featuring his Magico S3 speakers. Joni Mitchell’s “Carey” on LP reissue was a crowd-pleaser. The system captured the expressiveness of her lilting vocals along with satisfying transient attacks and decays on percussion and dulcimer. On other cuts, I noticed hints of upper-midrange brightness, but it didn’t detract from the presentation overall. Elsewhere in Amp Land, I saw and heard noteworthy demos from a host of esteemed global manufacturers. Handcrafted in Denmark, the Gamut M250i monoblock amps ($12,990 each) were demo’d with the company’s RS7 speakers, a Pear Audio analog front-end, and a cool lobster chair designed for high-end listening. Also hailing from Denmark, maker of exquisite high-end gear Raidho showed its always-wonderful 300Wpc Aavik U-300 ($30k) integrated amp driving the marque’s brand-new D1.1 2-way speakers (an update to the incredible-sounding D1s, which have been a reference of mine). UK-based Naim Audio presented its ultra-high-end Statement NAC S1 preamp ($90k), NAP S1 mono amps ($90k/each) driving Dynaudio Coincidence Evidence Platinum speakers ($82k). In its inimitably elegant Japanese style, Zanden presented its Model 6000 Class AB KT-120 push-pull integrated amp that with a max output of 100Wpc and a smooth, matte-white acrylic finish. A demo of the new(ish) MartinLogan Renaissance 15 hybrid electrostats was powered by the McIntosh MC1.2KW solid-state monoblock amplifiers rated at a hefty 1200W. Getting goosebumps while listening is a sure symptom of hi-fi madness, so I pick the MBL room (pictured above) with its amazing omnidirectional MBL 101 X-Treme loudspeakers driven by an arsenal of MBL 9011 amps, the 6010D preamp, and a United Home Audio Phase 12 OPS reel-to-reel tape player source (all big-sound, big-budget items) for resolution and pure excitement. The system was cabled by Wireworld Eclipse 7 (plus one new Siltech Triple Crown Emporer interconnect), with room treatment by SMT Sweden and Accurate Construction of Chicago). Sure, the bass got a bit boomy at high SPLs, but so what? Close your eyes, and there was Janis singing. This massive system’s presentation was easily the most three-dimensional, thrilling, and visceral experience of the show. A tie: Audio Alchemy electronics and digital player (ranging from $1795–$1995) paired with Endeavor Audio Engineering E3 mkII speaker system performed with detailed finesse and spacious soundstaging far exceeding its price, and the room with Joseph Audio Profile speakers ($7k), Jeff Rowland electronics ($5k–$15.9k), Cardas cabling, and a classic ATR102 reel-to-reel tape machine playing back Analogue Productions’ Chad Kassem’s mastertapes generated mind-blowingly rich, resolved, and lifelike sound that put many top-dollar systems to shame. Technically, it’s a Midwest or trade show debut (as it’s been promoted in retail stores on the coasts), but the Wilson Audio Alexx loudspeaker was the most heralded, promoted, and talked-about new product at the show. As improbable as it sounds, rooms featuring reel-to-reel tape decks as sources, and the number of women in attendance (especially those who weren’t just “in tow”). Also, I could swear I saw more monoblocks than ever before.